David Lapetina. Modified by Opensource.com. CC BY-SA 3.0. Smartphones put a wealth of games at users' fingertips, but many of the proprietary games are loaded with advertisements, in-app purchases, and other features that create less-than-stellar play experiences. While the open source world is not exactly known for the quality of its games, there are a wide variety of open source games available in the F-Droid repository that are polished and very playable. Many of these games are clones of proprietary computer games and board games, but they are still enjoyable and are excellent implementations of the games they are clones of. Below, I look at 12 of my personal favorite games from the F-Droid repository. All the games are released under open source licenses, with no in-app purchases or any of the other dubious features and annoyances that plague modern mobile gaming. Each games provides a single-player mode that does not require network access, so they are perfect for your next bus ride or plane trip. Because the list is quite lengthy, I have omitted Chess apps, which I covered at length in a previous article. Like I stated above, these are my personal favorites, and I am only covering a fraction of the games available in the F-Droid repository, so if I skipped one of your favorites, please share it in the comment section below. 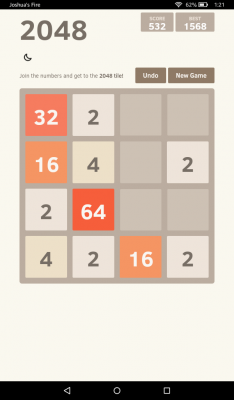 An implementation of the 2048 puzzle game. 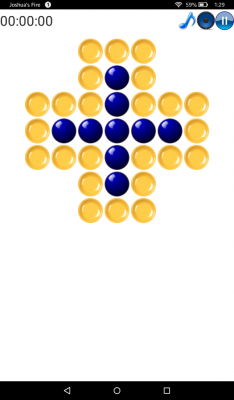 The game involves moving tiles with numbers on them around a 4x4 grid. Tiles start with a 2 on them, and each time two matching tiles touch they combine. 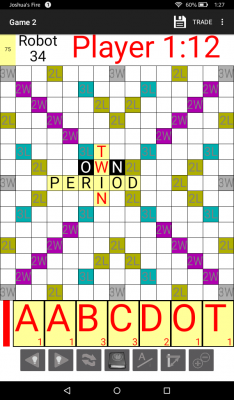 A 2 title touching a 2 tile would become a 4 tile, two 4 tiles touching would create an 8 tile, and so forth. The objective is to keep combining tiles to form a 2048 tile, but if the grid fills with tiles and there are no valid moves left, the game is over. 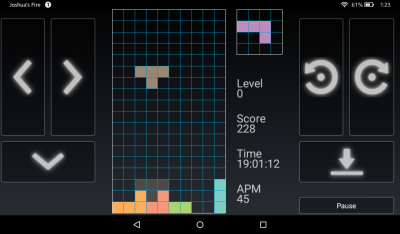 Blockinger is a Tetris clone. 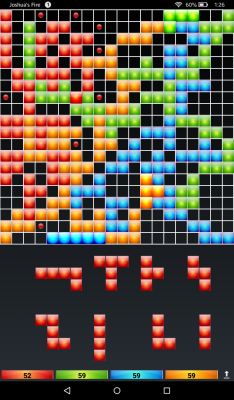 The standard Tetris pieces fall from the top of the screen and the player moves and rotate the pieces to create full rows of squares. When a line is completed, it disappears. Play continues with ever-increasing speed as long as the player keeps completing lines. However, if the blocks reach the top of the screen, it's game over. Blokish is an unofficial, digital version of the Blokus board game. Play takes place on a 20x20 grid and four players (in a single-player game, the computer plays all three opponents) take turns placing their playing pieces on the grid. Each player has 21 pieces of various shapes and sizes ranging from a single square to pieces that have five squares arranged in various formations. The first piece a player puts on the board needs to touch the corner of the board and each subsequent piece needs to touch the corner of a piece the player has already placed on the board, but it can not touch the side of piece of the same color. The goal is to use up as many pieces as possible and cover more spots on the grid than the other players while trying to deny the other players the ability to accomplish that same goal. Devinettes is a collection of riddles that the player can puzzle over and try to solve. The first riddle is the famous riddle of Sphinx, "What walks on four legs in the morning, then two legs in the afternoon, and three in the evening?" There are a total of 18 riddles to ponder over. While the game is open source, the answers to the riddles are SHA1 hashes, so you can review the source code without spoiling the game. Frozen Bubble is one of the more popular open source games on Linux, and this app version brings the same gameplay to Android. The object of the game is to remove bubbles from the screen by shooting bubbles toward the bubbles already on the screen. When three bubbles of the same color touch, they are all removed, along with any bubbles that are only connected to the rest of the mass of bubbles by the bubbles being removed. Once all the bubbles are gone, the level is over. 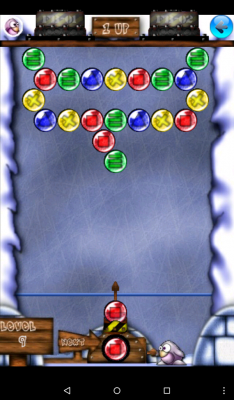 If the bubbles reach the bottom of the screen, the player loses. The single-player game can be played in Arcade mode, which gradually pushes the bubbles toward the bottom of the screen, or in Puzzle mode, where the only thing players need to worry about is their own mistakes. The game defaults to a "point to shoot" targeting mode, making it easy to play on a phone, but there are also options for an "aim then shoot" mode, which requires adjusting the angle of the shot manually before shooting, and a mode that lets the player aim by rotating their phone. 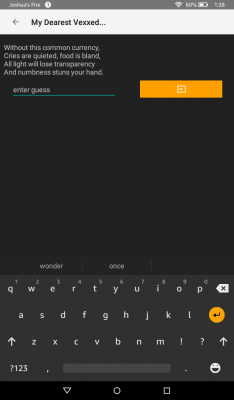 Similar to Boggle, Lexica has the player race against a timer to find words in a grid of letters. 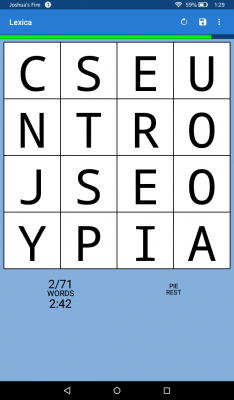 Words are selected by dragging across the grid from the first letter to the last letter of the word. Connections can be made in any direction, including diagonally. To change the difficulty, players can select from a 4x4 grid or a 5x5 grid. The time limit can also be changed to be 3 minutes, 5 minutes, 10 minutes, 20 minutes, or 30 minutes. In addition, the dictionary used for the word list can be set to US or UK English. Mahjongg Builder is a version of popular solitaire game played using a set of Mahjong tiles. The goal is the remove all the tiles from the screen by finding matched sets of titles. Titles that are covered cannot be removed until the tiles above them are gone, and tiles that have tiles to both their left and right on the same layer cannot be removed until a tile one side has been removed. 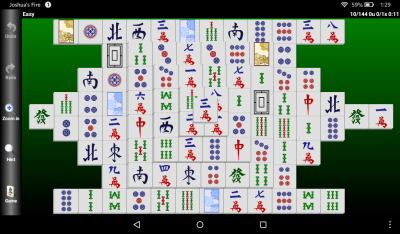 Mahjongg Builder comes with 19 different tile layouts, so there is plenty of variety. Marble One is the standard peg or marble solitaire game in app form. The goal is to clear the board by removing all but one of the marbles. A marble is removed when it is jumped over by the marble next to it in a straight line (no diagonals). A marble can only jump one space at a time, and the spot that it lands in needs to be empty. Marble One comes with eight different layouts, ranging from a simple cross to more complex boards that only have one free spot open at the start. 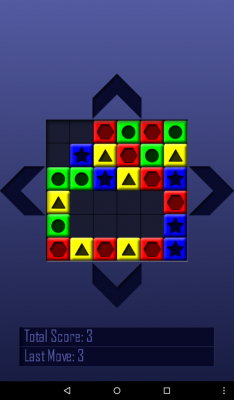 Puzzles is a large collection of different puzzles games. There are 39 games total, and each game is different from all the others. 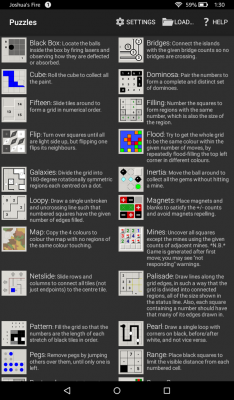 Several of the games are generic versions of popular brain games that can be found in a printed book of puzzles. Sudoku is included under the name Solo, KenKen is Keen, and Nonograms are Pattern. Minesweeper and other popular computer puzzles games are also included in the app. This app has plenty to offer, so puzzle fans should be able to find at least a few games that interest them. Shift is a puzzle game where players try to remove colored tiles from a 6x6 grid by connecting three blocks of the same color. The playing field begins with tiles only on the outer edge of the 6x6 grid and players move the pieces by pressing one of the four arrows on the top, bottom, left, and right of the board. Pressing one these buttons causes pieces to slide in that direction and start to fill in the center of the grid. If the grid completely fills with pieces, the game is over. 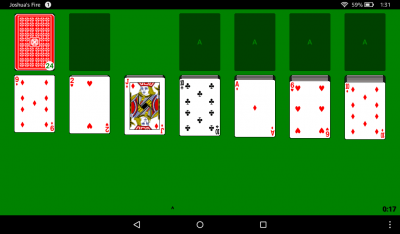 A collection of 10 different solitaire card games. The app contains the standard Klondike and Freecell games as well as Baker's Game, Black Widow, Forty Thieves, Golf, Spider, Tarantula, and TriPeaks. Some of the games, e.g., Klondike, have variants for drawing one card at a time or three at a time. The games play quite well on a touch screen, but it can get a bit cramped smaller screens. There is the option to use large card art, which makes it easy to see which card is which, but does not actually change the size of the cards. Offcourse there are many others like the Rogue like rpg Games, pixel dungeon for instance. My favorite from droid is anuto TD. A nice simple tower defense game. According to the play store entry, it's open source and includes 46 different variations, with no ads!